Europeans, NO PROBLEM, South Americans, NO PROBLEM, Americans, BIG PROBLEM . As soon as the letter R comes out of your mouth, when you recommend a Rose to an American Guest, they cringe and say : IT GOES AGAINST MY RELIGION TO DRINK PINK WINE!!!. We can all blame this on Sutter Home and Beringer for putting out that SWEET STUFF with loads of Sugar known as White Zinfandel which isn’t even White but PINK!! A True Rose is probably the most versatile, food friendly, refreshing wine to drink especially in a warm climate but yet Americans can’t get past the White Zinfandel Analogy . It also works in reverse when a guest is actually looking for a White Zinfandel and sees a Pink Wine on the Wine List and orders it and Cringes while saying: I THOUGHT THIS WAS THE BERINGER SWEET PINK WINE…THIS IS DRY!! A True Rose is made from almost 100% Red Grapes but using the french method of BLEEDING (SAIGNEE) you get the first Run Off of the Color Pigmentation of the skins of the Red Wine before Fermentation and you get a Rose Wine that has nuances of Red Fruit Flavors but with less Tannins or bitterness than you would if you would drink a full blown RED WINE. So basically it the perfect wine for a couple where one person prefers a light red and the other a light white.. The Compromise wine is ROSES. It is also the perfect Compromise wine when half the table is having light seafood and the other meats because ROSES GO WITH EVERYTHING Let’s take a look at a few of my favorites right now. I just taste this beautiful, french style rose from California. The Saintsbury Vin Gris of Pinot Noir is 100% Pinot Noir and is made in the same french method of Saignee discussed above. I have tasted a lot of Pinot Noir Rose’s from Oregon And California but they are too concentrated and have too much Residual Sugar in them. 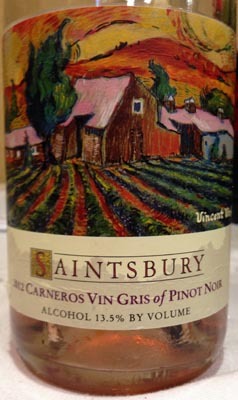 This Saintsbury was amazing and probably one of the most elegant, refreshing easy to drink Rose’s I have tasted in years and plus I am a sucker for the Vincent Van Gogh Label. 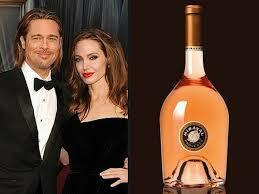 Hey…whatever works to get Americans to drink Rose. An oldie but a goodie favorite of mine from my friend Giovanna Tantini in Bardolino, Italy near Verona. 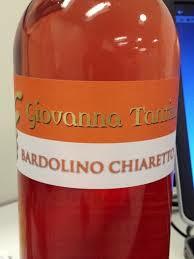 She is one talented winemaker and winery owner and I love all her wines however always my go to wine when entertaining or just chilling out in my apartment with some salami and cheeses is her Chiaretto (Blend in English) of Corvina And Rondinella. I love many Italian Rose’s but I have been drinking this one for the last 5 Thanksgiving Holidays as it pairs with everything. I have yet to find one type of food that this beautiful elegant Rose doesn’t pair well with. It as well is made in the French Style of Saignee and I always have a bottle or two in my Fridge for when I come home from a hard day’s work. PreviousWas I California Dreaming Or Did I Have Lunch With Stephanie Honig? ?